Charlton go for consecutive away victories for the first time since the start of last season when taking on Bolton tonight. The team will be under pressure throughout, and many of the new signings are not ready or available, so the team is likely to show few changes from the one that beat Portsmouth ten days ago. The Magic Boogie-man is injured and the Song-ster away playing for his country; Zheng Zhi has travelled though and may make the bench. Injured key-trio Young, Reid and Darren Bent are all reported still to be out, though Reid may also make a substitute appearance. Subs from Myrhe, Randolph, Sankofa, Zhi, Hasselbaink, Sam, Reid, Ambrose. 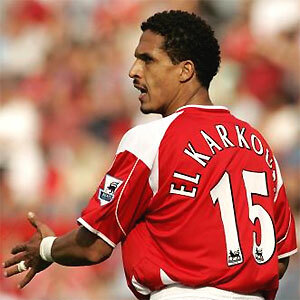 I would play the Moroccan at right back, as his height may be better used than Sankofa's. Apart from that, I doubt we'll see many other changes this time round. Pedro45's score prediction is a 3-1 defeat; I really cannot see us holding Bolton on the form they showed last weekend at the Emirates stadium. Unless they are tired, or rest players, or Charlton's form really has risen a notch or three since Pards took over, then the two previous wins against Bolton this season are all we can hope for. The crucial news from today, and tonight, is not with this game, or result, because realistically anything from it would be a bonus, but with the transfer window. The biggest step in survival this season would be not selling Darren Bent today, to West Ham or anyone else. Richard Murray has said that plenty of clubs want to be involved when that time does come round, as it invariably will, but in the mad last day scramble, the best price will not be gained. I say hold on to him and if we fail to stay up, let us auction Dazza off properly at season end. Therefore, my one to watch is going to be Mr Murray; I hope he enjoys the game, and once over, he turns his mobile phone off, and gets in the car for the long drive back down the M6 and M1 with some lovely classical music belting out. He can answer Curbs desperate texts and voicemails tomorrow morning with a "sorry, too late" reply! I just wanted to be the first blog to use this title - today Charlton made another transfer window signing by gettng Alexandre Song from Arsenal to sign on the dotted line for the rest of the season. 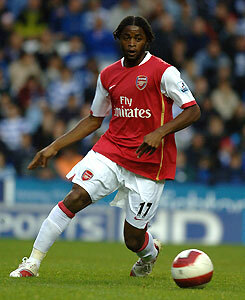 Song scored recently in Arsenal's big win at Anfield, and is a midfield player of some ability and potential. Where he fits into Alan Pardew's thinking will be interesting to see come tomorrow night's game at Bolton. The third player to arrive at The Valley in this January transfer window is yet another footballer carrying plenty of fanfare and excitement. Whereas Zheng Zi came to Charlton with a whole bunch of Chinese media-men in tow, and Ben Thatcher with a bad reputation, Madjid Bougherra was signed yesterday from Sheffield Wednesday with a few bad vibes from the selling club (who obviously didn't want him to go) and a reputation for dazzling play. The YouTube compilations unearthed and placed on a couple of other blogs (thanks NYA and Wyn!) show us that we have a player who seems unafraid to show his skill anywhere on the pitch. If Talal El Karkouri can do the odd overhead kick, drag back, and dummy, then this guy can do all that and much more in nearly every game! My only doubt was that in some of the games where we saw these tremendously skillful clips, the scoreline showed the Wednesday were losing! He does have great interceptory skills, can read a game, is quick, strong, and is very skillful. The best part though is that he loves to run the ball out of defence at every opportunity; I don't mean in the Bobby Moore/Rio Ferdinand sort of way, strolling forward, before rolling the ball off to a midfield colleague. No, he thunders out of defence at full pace, running with the ball, plays it into the forwards and then carries on hoping for a return pass! If he plays with Jimmy-Floyd or Marcus, we should regularly expect him to be the farthest forward player in the team on any number of occcasions! He certainly hasn't got an easy start to life in the Premiership, with his first three matches away at Bolton and Manchester United, and at home to Chelsea. It may therefore be rather unfair to judge him on these games, if indeed he does get to start or play a significant part. This is a good signing though, and along with Thatcher, shows the sort of player that Pardew is looking for. If there is no other activity in this trasfer window, then Charlton will have come out of it OK - offloading Andersen, and Traore, with the possibility of Thomas Myrhe going back to Norway too, and bringing in three players on less total salaries. Pardew was interviewed by Sky at the weekend (when picking up the performance of the week trophy) and he did say that we would expect to play the rest of the season with the players we have got, clearly indicating that Darren Bent was not going anywhere (Pleeeeease!). Now the Boogie-man has arrived, does he have any other tricks up his sleeve, and if so, how is he going to balance the books? Wow! It's been a long, long time coming, but Charlton have finally broken their away day hoodoo in the Premiership and been victorious away from SE7! Amazingly, it was Amady Faye who scored the only goal of the game (left), against his former club - his first ever goal in English football after almost four years of trying! This was a wholly satisfying performance from the Addicks, shorn of their best three players through injury (Darren Bent, Luke Young, and Andy Reid), and playing an away game formation of 4-5-1 that allowed counter attack from the basis of solid defence. Alan Pardew must get a lot of plaudits for coming up with the right side for this game, making four changes from the side which was beaten at home by Middlesbrough. In came Bryan Hughes, Osei Sankofa, Faye, and Jerome Thomas, and out went Ambrose, Diawara (who was man of the match last week), Hasselbaink, and the injured Reid. 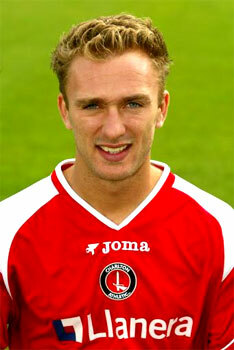 Charlton played well from the start, and dealt with the abuse hurled in the direction of Ben Thatcher quite well. Maybe this difused the pressure on other players? Chances were created at both ends - Andy Cole missed a few opportunities to give the home side the lead that he may have taken in his younger days, and Rommedahl put over some good crosses that Charlton forwards failed to convert. From one, Marcus Bent connected well, but rather than go for goal he chose to set up Hughes who just failed to connect with the headed pass. With more confidence, Bent may have scored? Rommedahl continued to cause problems for Portsmouth in the second half, knowing he could leave Djimi Traore dead for pace whenever he wanted. He broke clear midway through the half only to delay and allow Campbell to make a saving tackle. Again, with more confidence, we may have seen better end product from the Dane rather than another wasted effort. With just over ten minutes left, Faye took a pass from Thomas, and played a one-two with Hughes on the edge of the area. As two Portsmouth defenders converged, Faye scopped the ball goalwards, over David James and in at the near post. His delight was obvious! The remaining time was spent defending, making substitutions - Thomas, Bent, and Rommedahl all being replaced by more defensive minded players as Pardew looked to hang on to the win. As the game went into injury time, a cross was headed goalwards by Cole but Carson made a great diving save. Scotty definitely gained Charlton a couple of points by making that save. At the final whistle, the players hugged and smiled; it has been a long time since they have ground out such a result away from home. Three points bring Charlton ever closer to West Ham (just one point ahead), and now Wigan (who play today) are just a win in front. Sheffield United - who lost at Reading - are now only five points ahead. It is unfortunate therefore that the next three games are equally tough, as any gap may widen again before the next crucial game comes along (against West Ham, in five weeks time). Having written off Charlton's chances of surviving this season out of the bottom three last week, it would be stupid to change my mind after this one win. The result does bring a glimmer of hope, and with no game next Saturday, a chance for injured players to get back into contention. Bolton have a tough cup game next Sunday, and play Charlton just three days later on 31st; after being spanked 5-1 yesterday, they may not be in the best of form if Charlton have key players back and can put together a decent game plan for the visit to the Reebok. After that, nobody expects anything from games against Chelsea and Manchester United, even if the Russian-owned team have defensive frailties themselves (goal-glut anyone?). There are still fourteen games to go till the fat lady sings; that's plenty of verses to learn, hear, listen to, and sing along with before we know what sort of a summer we will have. I loved the quip on another Charlton blog site today that the roof of the away end at Fratton Park had been blown away in the recent gales! If only it was that simple! Anyone who does travel to Fratton Park on Saturday will have my sympathy, because the wind could be howling, rain pelting, and Charlton not very good either! Well, Pompey haven't won for three matches; their worst run of the season. 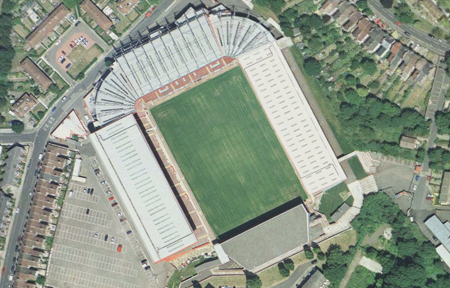 Charlton's last away win was here in October 2005. Dennis Rommedahl scored his last goal in that win. 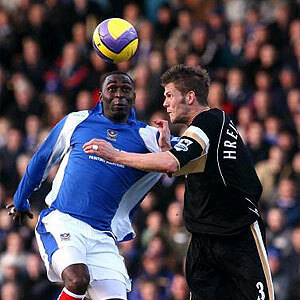 Djimi Traore now plays for Portsmouth. Ben Thatcher will be boo-ed at every touch and that could influence the play (maybe a Pompey player will be out for some sort of revenge and will get sent off?). Jimmy Floyd Hasselbaink isn't injured. Ben Thatcher will be boo-ed at every touch and that could influence the play. The team that Pards chooses pretty much picks itself; so few options does he have up front or in midfield. This is who it looks like for this weeks version of the Try To Win Away Game! Subs from Myrhe, Sankofa, Zhi, Hughes, Sam, Kishishev. This game could be a good one for the Addicks, or just another in the long line of turn-up-and-lose fixtures we have seen far too many of in 2006/7. If the team are able to bounce back after losing at home to Boro last week, now would be a good time to do it. It really is about time that some of them started earning their wages, and playing like a "team". We need Rommedahl to know he can whup Traore every time; JFH and Big-Benty to believe that they can score goals at this level; the defence to look solid for 90 minutes; and Scotty to start making those great saves we have seen him capable of. If not, then another comfortable home win looks on the cards, and Harry will go home a happy boy. My one to watch is going to be Souleymane Diawara. 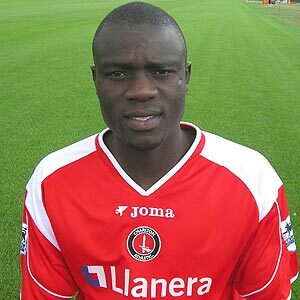 Souley seemed to be on his way to the south coast a couple of weeks back, but a change of heart/UEFA rules/newspaper gossip being wrong meant he still plays in red. It is now up to him to show everyone that he is at the right club, and he can form a decent central defensive partnership with the man alongside him. Pedro45's score forecast will either be a 2-0 defeat, or a 2-1 win? What do you think - heart or head? In days gone by this would be an obvious game to spring a surprise, but the "old" Charlton spirit seems to have been lost, and we don't get too many nice things happening in the Premiership these days. But, in the spirit of being an optimist (even though I'm a realist) I'm going for a 2-1 win, and a beaming AP at the end of the match. I think that we can call it quits now; our Premiership dream is all but over, or will be at the end of this season. Results didn't go against us involving the other teams in the relegation battle - West Ham, Reading and Sheffield United drew, and Watford, Villa and Wigan lost - but Charlton are six points from safety now, with no real sign of any points being picked up in the near future. Sure, we could win home games against Wigan, West Ham, Sheffield United, Reading and away games at Watford, and Manchester City, but that really doesn't look like it may be enough any more. Sadly, winning those matches may be Charlton's only hope after the next run of four matches that, on paper, look decidedly losable - Portsmouth, Bolton and Manchester United away, and Chelsea at home. The Boro game yesterday that was so important started quite well. Alan Pardew made another bunch of changes, bringing back Carson, Diawara, Hreidersson, Reid, and new signing Thatcher, and continuing with the 4-4-2 formation, which meant further run outs for Hasselbaink and Marcus Bent up front, and Ambrose and Holland in a re-shaped midfield. Rommedahl put over a couple of decent crosses; Bent was lively and involved, and Reid passed the ball around confidently, even if some of those passes went astray. The new look defence, with El Karkouri at right back, looked solid enough, even with the strong wind causing a few problems when judging the flight of balls. After 27 minutes, a long punt forward was chased by Bent, and the ball broke to Hasselbaink who mis-hit the ball into the ground (top) but over Schwartzer and into the net. The crowd seemed quite surprised at this result, and round-shaped Jimmy did a tumble roll to celebrate (left) which could have seen him roll on forever if he had got it wrong! Two league goals for the Dutch striker this season, and both against former teams; can we play Leeds next? Bouyed, the fans got ever noisy and the team more confident. Ambrose was too fancy sometimes, and Holland got booked for a foul - only his second ever booking. Then it all went pear-shaped. As the crowd looked for the half time injury time board to go up, Reid was caught in possession centrally in midfield, and as has happened so often this season, the result was clinical and precise. Pass, pass, pass, free man, side foot goal (left). 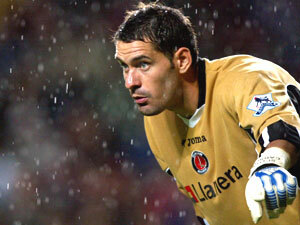 Carson had no chance, and was obviously gutted at conceding late in the half. 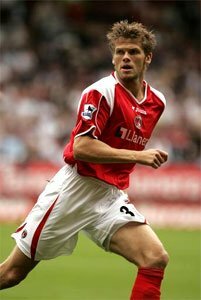 There was still time for shell-shocked Charlton to watch as Viduka hit a stunning volley which rippled the top of the net having gone just over the bar, and Marcus Bent to miss a gilt-edged chance at the far post that would have restored the lead for the home side. The second half opened with Viduka missing a sitter from four yards when he volleyed into the ground and amazingly over the bar. 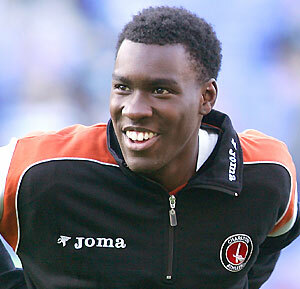 But then Charlton settled, and played quite well, but without looking too threatening. Reid took control, Diawara looked commanding at the back, and Thatcher ventured forward. It was a shock to all therefore when a harmless looking cross into the box was completely messed up by Hreidersson (who attempted to chest it back to the keeper it seems) and the loose ball fell beautifully for Arca to slot home. Again, Carson had absolutely no chance. The crowd were stunned. Hermann was apologetic. Four minutes later Yakubu smashed in a shot from the edge of the area after being allowed time to turn and run by El Karkouri. Carson groped at the swerving ball but realistically didn't have any chance again. The heart was ripped from the home team, the home fans at that point, and bar a volley by Holland that was well saved, Charlton had nothing else to show in the game. It was funny walking away from the ground; none of the team played that badly this week. 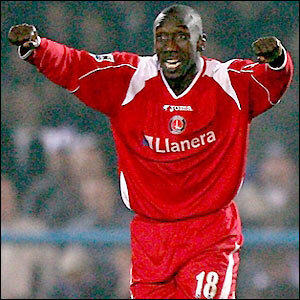 Sure, Hasselbaink did little, but he did score. Marcus Bent tried for an hour or so, but was then mysteriously taken off with twenty minutes to go in favour of Lloyd Sam. Rommedahl did OK and put over some good crosses, and Ambrose and Reid tried to get forward and make telling passes. Sadly though, this wasn't enough - the midfield was too lightweight (even if Ambrose and Holland did get booked, as did Hasselbaink for a terrible early foul on Boateng); the forwards did not gel together once more, and Rommedahl couldn't get to the by-line often enough or beat his man on the outside. The game was lost by the time Sam, Thomas, and Hughes came on as subs. The three departments - defence, midfield, and attack - looked fragmented and do little to help each other most of the time. Pardew knows this, and maybe we will see new players in time for the next games which will help. Maybe China captain Zheng Zhi, introduced at half time to the crowd to whom he gave a much photographed wave, will help? He could provide some solidity but we will have to wait and see. This game and result has, for me, decided the season - I now don't think we can survive. Pards may well buy in some players, have Young and Bent (D) able to return soon, but I just cannot see that being enough now. At what point will the board and manager also come to this conclusion - probably not for a month or so, and by then we will have played the next four games and will come to a crucial six-pointer against West Ham that may well go a long way to deciding their and Curbs fate too. It really could get very nasty tomorrow. Charlton versus Middlesboro games have been pretty dour over recent years, apart the the goal-fest cup quarter final replay that saw some kamikazi defending and six goals plundered, with most in Charlton's net. This time, the game is at what can only be described as make-or-break time for the Addicks - Lose this one, and every other Premiership team outside the bottom three will be fast disappearing too far over the horizon. In this weeek have come Zheng Zhi - the China captain - and Ben Thatcher - the, a- hem, Welsh defender. Both have a history of not being slow to put in a little (too much) effort every now and then. Both have needed to complete hospital visiting books over the last couple of years. However, us fans do want to see players "fight" for our club, and the "Entent Cordial" at the back of our defence has just got a bit of Red Army bolstering. Pardew can also, hopefully, recall some of the lesser injured players who have been missing recently - with the possibility that Hermann Hreidersson (left), Andy Reid, and Luke Young could all be involved. I doubt all three wil be back, but we are likely to see a couple of them either on th pitch or bench. The other option is to hold them back and hope that another week or two off will prevent any relapses that could mean further time on the treatment table. I'm not sure if the Sankofa appeal means he can play or not? It will be interesting to see what the outcome is or whether we can add the FA to the list of BBC, most newspapers, UEFA and Sky as organisations that don't seem to like Charlton that much at present. Subs from Myhre, Zhi, Thomas, Faye, Fortune, Hasselbaink, Ambrose, Reid. My one-to-watch tomorrow has to be the Thatch-man. If he can inspire the defence to keep control, hold the ball and not hit forty yard passes to the oppo defence, then we could be OK. He will need cover in big Hermann, and the man in front of him, but he should be OK.
Pedro45's score forecast is for a 0-0 draw. I just don't know if our "strikers" are capable of getting a goal at present. With the tight game forecast, they will sit deep to combat Rommedahl's pace, and flood the midfield to stifle any creativity (if we had any). It will need a flash of brilliance from a Charlton player to win the match - oh for a thumping header from Hermann at a corner, or Dennis finally breaking his Valley duck with a dribble from penalty box to penalty box and a thumping shot into the top corner to finish. Or maybe Lloyd Sam will get his first Premiership goal, or El Kak will smash one in from forty yards, or Marcus will score one like he did for Ipswich at The Valley on New Years day a few seasons ago. Maybe...Maybe. Yes, it really could get very nasty tomorrow - the weathermen are forecasting lots of win and rain. So we have a new midfielder, according to the official Charlton website - versatile midfielder Zheng Zhi. Zheng, who is the captain of the Chinese national team, will hit the Premiership trail after signing on loan from Shandong Luneng. After Sun Jihai, Li Tie, and Li Weifeng, Zheng becomes the fourth Chinese player to play in the Premiership. The 27 year old, who can also play in defence, is 181cm tall and weighs 75kg. Zheng, the father of a little two year old girl, is regarded as the hero of Chinese football. Many experts believe that he will have no problems playing in the Premiership, as it is said that he is the best Chinese footballer of the last ten years. Zheng is the engine of the national team and is irreplacable apparently. 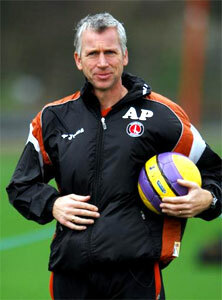 Alan Pardew is not so convinced, and will wait to see Zhi (or is it Zheng?) in training before deciding whether to play him (or sit him on the bench) for the crucial Boro game on Saturday. 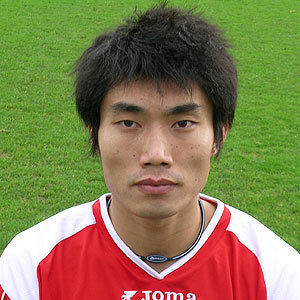 He scored 21 goals to lead Shandong to the title last season. He has been a great success in China, and the hope is that he will be well received by the Addicks faithful when and if he gets to don the red shirt. Zheng was born in Shenyang, a football city, where China's World Cup qualification dreams came true in 2002. He is in London with his wife, leaving his daughter in the care of his parents. A few Chinese players have gone to European countries in recent years, and most of them have struggled (Sun Jihai excepted). Hopefully Zheng Zhi can buck the trend. Thanks to Oleole.com for this information. Iain Dowie was interviewed on Five Live's Sportsweek radio programme this morning, but failed to lift the lid on any new revelations as to why he was sacked by Charlton. He did say that he felt the players were good enough to retain their Premiership place this season; that he had 100% backing from Les Reed; and that he got on well with Richard Murray and particularly Peter Varney, who backed him in his court case. He also said "You know..." forty-eight times in seven minutes. 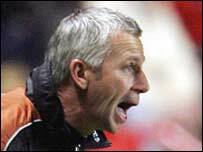 Henry Winter, the studio guest summised that, as Dowie and Reed had been relieved of their duties, but even Pardew was now struggling to get results, that the problem may lay with the players, some of which Dowie had bought, so he wasn't entirely blameless. Well, there goes the FA Cup dream for another twelve months. This result also keeps Charlton well and truly in the spotlight, as this will be perceived as one of the shock results of the round. 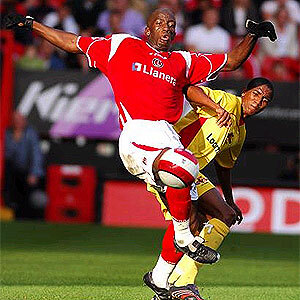 Deep down inside though, many Charlton fans will know that this just wasn't a giant-killing act at all. Charlton were not just poor; according to reports on radio and TV, they were (and I quote) "inept", "woeful", "without commitment", and "embarassing". That is without the Match of the Day pundits chiming in with their three-penneth worth. For the first goal (above), Ambrose let the full back run (he'd obviously forgotten about Tuesday night when he did exactly the same thing for Hoyte's goal...), and his cross was turned in easily by the unmarked Agogo. Traore had vanished from the pitch at this point apparently; maybe we should get the Torchwood team to investigate as Djimi is prone to the odd mid-game disappearance? 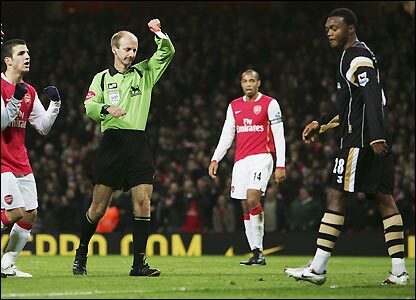 Holt headed the second four minutes later (left), just after Fortune had hit his own bar, when he was left unmarked once more. Come on, spot the Charlton defender marking any of the three Forest players in the picture? Whether Troare had re-appeared by this point, I'm not too sure, although that does look a bit like him lurking in the background trying not to mark anyone. Both goals came within minutes of Faye going off to be replaced by Diawara, with El Karkouri moving to right back, and Kishishev shifting into the holding midfield role. The team is so poor now, that I think it's about time I did my annual report on the squad - mainly those that played a part today. Pards, I hope this helps you with your decision on who stays or goes this month and at the end of the season. The great thing about today for Scott was, he didn't play today! Liverpool didn't give him permission to play for us in the cup, as they thought they might need him in May (when his loan is up) if they make the cup final. The likelihood is that Arsenal will win at Anfield later today, and he can forget about winning any medals for this season apart from possibly the Charlton Player of the year one. Sometimes good, sometimes terrible, you just cannot predict how El Karkouri will play. He does try each match, but sometimes you wonder if he has too many languages talking to him in that big Borat brain of his. Why he continues to whack free kicks into walls or upper teirs of stands I just don't know. His defending is OK usually, though he does take chances all over the pitch. Too slow for a full back, and he doesn't overlap enough to help the team, his best position is central defence, where he can do a reasonable job. It would be interesting to see him play for a while in central midfield and put some tackles in, though the only time that was tried a couple of years back he got sent off for jumping two-footed at Zoltan Gera. Jon Fortune is not a Premiership player. 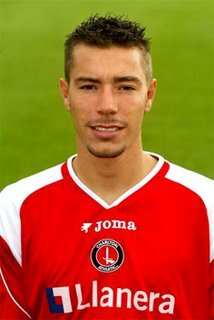 He has worked hard at Charlton, and is a reasonable squad player, but his lack of regular playing time recently has left him short of match fitness, and when he comes into the team, he looks lost and bereft of ideas. His only pass is to whomp it forward forty yards to a forward, and then the pressure comes back on the defence again. Fortune is short on pace at the top level, and that has to be his biggest weakness. Apparently other "top" clubs have been interested in him over recent seasons - Villa being one - and I think the time is now right for Jon to move on and play his football elsewhere. When I first saw Diawara play (at Fulham), he reminded me of Richard Rufus. Strong, big, black, quick, athletic. So what has gone wrong? He just doesn't seem to speak the same language as the rest of the squad (literally, even though Traore, El Karkouri, and Faye are fluent in French too), and looks lost at times on the pitch. Apparently he has not yet acclimatised to the pace of Premiership football; well, Souley, how long will it take? 'Cos if you wait any longer we won't be in the Premiership. If he can get it together and play as well as he looks like he should, then the boy has a chance. If he is just here for the cash, then he might as well go now so we can spend the dosh (even if it's just his salary) on someone else. Kish has stayed on long enough now; his contract has almost finished and he isn't good enough to hack it with the big boys any longer. He has insufficient pace at full back, and needs two touches when playing in midfield, and he just doesn't get that opportunity any more. Time to move on. Matty is a whole hearted trier. He was once club captain, but that was stripped from him in order to keep Luke-Warm happy. He is one of the few leaders at the club. If only Matty had the legs that he had five years ago...he does always try, unlike some of his team-mates, but sadly that just isn't enough these days, especially when he has such a lack of support in the middle of the park. Well respected though he is, his time at The Valley is coming to an end, especially if by some miracle Charlton do beat the drop. On a very good salary, the problem will be off-loading him to someone in the south-east of England area (his wife has a horse riding business in Suffolk and he won't move far away from that...) who will pay him enough money for a couple of years (Ipswich and Norwich no longer being able too...). Once Premiership class, but not anymore. What can you say about Amady Faye these days? When he joined, his heart seemed to be in the club and he put in good performances against West Ham and Bolton when asked to play in central defence in a ten-man team. He also did reasonably well in midfield, his favoured position early in the season. Since then though, he has got worse and worse, and his performances recently have been quite literally embarassing. Maybe it's the cold weather that he doesn't like? Lasted a mere 25 minutes today before being withdrawn; it may have been injury or illness related (as it was when he got tugged against Liverpool); why is he bothering? 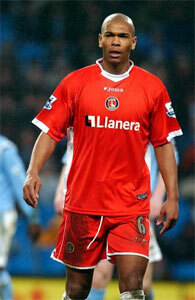 Not a Charlton "sort of player"; he lacks effort, commitment, passion, skill, and endeavour. If Darren Ambrose does have a telepathic link to Darren Bent, then his knee must be hurting at present! Maybe that goes some way to determining why he just fails to shine very often. Capable of blinding goals (remember Man Utd? ), he gives the ball away too much, and concedes too many fouls when trying to win it back. That is, if he bothers trying to win it back. Cuts inside onto his right foot every time when playing wide left, his crosses are almost never met by Charlton heads. He is now a poor mans version of James Milner. Still young, but has failed to get any better over about three seasons now, and his Premiership time is just about up. Jimmy, Jimmy, Jimmy. The fanfare that heralded his arrival was muted by stories of dressing room unrest created by Gerel, and the general laziness by which Charlton fans percieve his play in recent years. Nothing has shown us fans that we were wrong. he doesn't work; whinges when the ball isn't given to him; and berates other players if his passes aren't made to look good even if they are poor. Maybe we should just play him against teams that start with the letters C and H, as his only goals for us have been against Chelsea and Chesterfield. 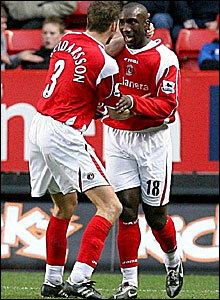 No wonder he had a habit of scoring against Charlton! We paid £2,000,000 to Everton for Marcus Bent. Lloyd Sam: Given ten minutes today, and almost changed the game single handedly. It cannot be long before Pards starts to pick him from the start, as our other wide players are just not doing it at present. I just hope that the manager doesn't go and buy players who will play in front of him, because he is one breath of fresh air in a season that stinks. Tommy Myhre, Darren Bent and Djimi Traore are all Premiership class obviously. Tommy because if he isn't, he wouldn't have played for Everton and Sunderland in the Premiership back in years gone by. Dazza because he is fantastic and gets most of our goals when we are all those adjectives that the TV and radio call us. It's not worth rating big Hermann, Luke-warm, either of the Uruguayans, the fantastic little Oirish fella, the Yank who hasn't played, or any of the youngsters, as who knows if and when we might see any of them in the first team again (if ever). Pards mate - we are rubbish all over the park. Please start to speed up the wheeling and dealing during this January transfer window, because if you don't, not only will be be down before Easter, but we won't have a prayer of getting back up again with most of this lot. Alan Pardew led his team out on cup final day last May, and we Charlton fans are all hoping that history repeats itself for Pards this year. 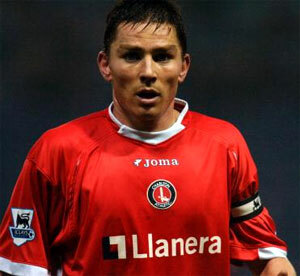 Charlton's FA Cup campaign kicks of away at Nottingham Forest tomorrow, in a tough game against the League one leaders. The bad news is Charlton have not performed well against lower league opposition recently, and that Osei Sankofa is banned, plus Young, Hreidersson, Bent (D), and Reid are still all injured. The good news is that Forest have two players banned after being sent off during a thrashing in their last match. Charlton meanwhile do have new signing Zheng Zhi available, plus returned loanees Walton and John are back at the club. Subs should be from Myrhe, Ashton, Kishishev, Faye, Zhi, Walton, Thomas, and Simmons. This is a game that Charlton should win, but without an away victory in 90 minutes since this stage of the tournament last year, it will be a tough ask. With a raucous crowd - both ends singing their versions of Mull of Kintyre! - the pressure is on the Premiership club to hold sway and fight out the victory that Pardew will demand. Pedro45's score prediction is a 1-1 draw, and a happier home leg in ten days time. My one-to-watch is Bryan Hughes - I don't remember having him as my OTW before, but he does like the odd goal against the lesser teams, and he should get enough of a run out to improve his record once more. 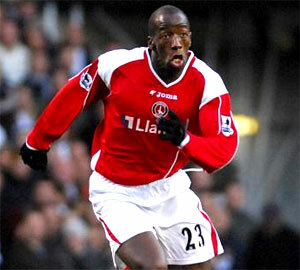 Charlton to sign Collins John? Reports indicate Fulhjam have accepted a bid for Dutch striker Collins John from a Premiership club, and with Charlton having been linked with John earlier in the week, it is likely that he will join the Addicks today. John scored for Fulham at The Valley last season, but was a second half substitute in the match after Xmas this season. Pacy, and a good finisher, John will be excellent cover for Darren Bent while Dazza is out injured, should he sign. Mike Riley - don't you just love him? The man who gave Chelsea a last minute penalty when Frank Lampard dived into the Charlton box a couple of years ago did even better last night, awarding two penalty kicks to the home team, and sending Osei Sankofa off. OK, they wre both undoubted penalties this time, but it was harsh on Osei as he had cover in El Karkouri and was not the last man between van Persie and scoring. Stupidly, the already booked Diawara should have gone off later, when he fouled Henry and then kicked the ball away in frustration, but Riley missed that. Inept at every turn! In between, Hoyte scored the Gooners second, when left free by Ambrose to run onto a return pass. Late on, van Persie gave the scoreline gloss by chipping over the superb Carson to make it four. I don't believe that this will go down as a bad Charlton performance, whatever the score looks like. At least the team competed, and with no real result expected, the sending off just compounded the problems. Sadly Darren Bent missed the game and is injured, having fell when shoooting against Vila on Saturday, just before half time, and he is out for a few weeks it seems. It wouldn't surprise me in the least to see one of the youngsters - Simmons, Walker (when back from Orient), or Carvill for instance being brought into the squad and getting Premiership playing time this month. Lisbie is still around, and not too far from fitness it seems, but he isn't a long term answer to any goalscoring requirements. The injury to Dazza has further implications with regard to the January transfer window. It had been presumed, in the wheeling and dealing that Pardew needs to do to raise money for new players, that possibly big Bent, and maybe Hasselbiank, amongst others, may be sold off to finance acquisitions. That would be dangerous now if Dazza was sidelined for more than this month. It would not surprise me in the least now that some of the other fringe players have to go, in order to raise enough cash for the right sort of team players Charlton need. While nobody would be too bothered if Faye, Traore, Sorondo, Pouso, and Fortune (plus Marcus and Jimmy Floyd) went in this months firesale, I now thnk that in order to get some cash, some or all of Young, Hreidersson, Hughes, Rommedahl, Thomas and Ambrose may be offered up to bidders. Some other bit-part players (Youga, Ashton, Elliott) may also be off-loaded to lighten the wage bill further and provide more cash. Alan Pardew will need to be looking long-term, and he may have to be quite drastic with his transfer actions during January if he really does want a chance of avoiding relegation with the Addicks this season. 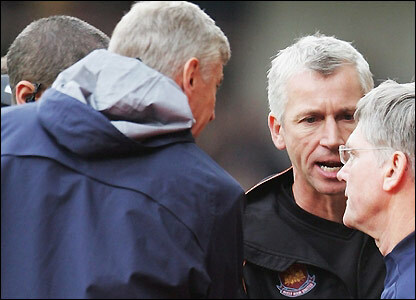 Pardew vesus Wenger, seconds out, round two. Ding Ding! How we all laughed when West Ham beat Arsenal with a last minute goal a couple of months back, and Pardew's goal celebrations took him very close to the Arsenal dug out where the Frenchman took exception, and a small bout of handbag throwing resulted. With Pard's now installed as the Charlton boss, a quick re-match has resulted, though I'm sure the pair will be on their best behaviour. I cannot imagine Wenger dancing a jig down the Emirates Stadium touchline as van Persie gives Arsenal the lead, turning to the crowd behind Pardew and flexing his biceps aggressively, giving it large - would he? Maybe Pard's had better not get too close if by chance Charlton do score, as the police and stewards may be wanting a chance at revenge of their own...deep inside though, he (and us) would love to stick it to Wenger again! Obviously the run of four games in eleven games is tough on the players, but Charlton have had a little extra time to refresh themselves over the weekend, and hopefully those who played on Saturday will be fit to resume. Darren Bent (left) will be on a consecutive matches hat-trick, having scored against Fulham and Villa last week. It would be great for him to make it three goals in three games. Marcus Bent needs to contunue to show the effort that he has in the last two matches, and he could be the one to cause the Arsenal defence problems if he decides to get involved. Rommedahl and Ambrose need to continue to cause threat from out wide, and Jerome Thomas will no doubt also be involved at some stage. A winger cannot beat his man and supply a great cross on every occasion he gets the ball, so we should not expect that, but we do need to see some consistent results and decent ball played into the middle on a more regular basis from all three players. They all also need to fight back when not in possession; that has been lacking this season until recently, and it is good to see Rommedahl and Ambrose making (or trying to make) tackles. The middle of the park is crucial when playing Arsenal, so I would retain Kishishev rather than Villa match-winner Bryan Hughes from the start. Hughes-ie can come on later if required. The defence is also unlikely to be changed, with Sankofa getting better with each start, but El Karkouri, Hreidersson, and Traore need to keep the errors to a bare minimum if a rout is to be avoided. Hopefully, the lack of apparent Arsenal fire-power (no Henry or Adebayor) will help? Subs from Myrhe, Fortune, Hughes, Thomas, Hasselbaink, Sam, Ashton. My one-to-watch in this match is Matty Holland. Evere since he joined the club, he has struggled to fit in completely. 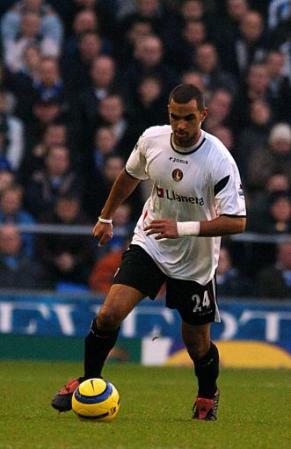 First, he upset the central midfield balance between Scott Parker and Claus Jensen; initially Jensen moved out left, but eventually it was Matt who played wide right during the clubs best Premiership spell just prior to Parker leaving. Then a knee injury slowed Matt down, and he has not been at his best in the last two seasons. This year, we are seeing an older, wiser, Matty, who runs and runs all game, and recently has been getting stuck in and making tackles in a manner we have not seen before at The Valley. Pardew has obviously revitalised Holland and made him aware that he is key to the clubs Premiership survival chances (saying he would still play to win even if he inherited £40m!). If Charlton are to get anything from the Emirates stadium, then another big game from Holland is crucial. Holland has the respect of other players, the fans (whom he acknowledges after every game), and the manager. He is a leader by example. If the rest of the side put in as much effort as Matty, we should be OK by May. Pedro45's score prediction in his Online game was a 6-0 thumping; but that was before Pardew arrived, and the clubs fortunes appeared to change. On this site, I will revise that to a 3-0 loss. I still think Pardew will invoke more effort than we have seen in recent away matches, but unless we get lucky, very lucky (and I guess we are due? ), I cannnot see Charlton troubling the Gunners too much. Of course, if the will-to-win and fighting spirit have returned, and Arsenal have a bad game in front of goal, and the ref is not home-biased, and Wenger is now scared of upsetting Pardew and tells his team not to score, and Charlton play better and with more confidence at this stadium than they did at Highbury, and 2007 really is going to be a whole lot better than 2006, then we have a chance. Wouldn't that be a great way to start the New year!